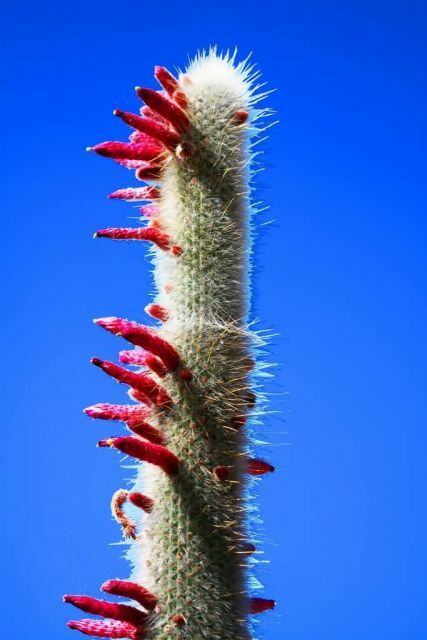 Silver torch cactus or wooly torch cactus is a perennial cactus of the family Cactaceae. It is native to high mountain regions of Bolivia and Argentina. Its slender, erect, grey-green columns can reach a height of 3 m but are only about 6 cm across. The cactus prefers free draining soils, strong sunlight, but not high temperatures. Interestingly they used to grow in temperature of -10 degree celsius. In its natural habitat it receives plenty of water during the summer. In cultivation, watering too much in winter often leads to root rot. They are produce deep red, burgundy, cylindrical flowers in late summer.